Memorial Day was officially proclaimed in 1868 by General John Logan, national commander of the Grand Army of the Republic, in his General Order No. 11, and was first observed on May 30, 1868, when flowers were placed on the graves of Union and Confederate soldiers at Arlington National Cemetery. • 1890 - Memorial Day was recognized by all northern states. What changed? The holiday now honors all Americans who died fighting in any war, not just those that died fighting in the Civil War. 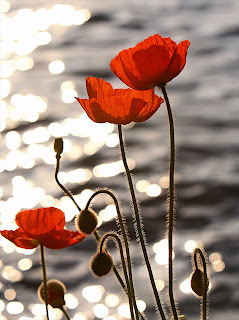 Memorial Day (Remembrance Day, Poppy Day, Armistice Day) is a day to remember those of the armed service who gave their lives in service to their country since World War I. How did poppies come to symbolize Veterans? Now 75 years later the Veterans of Foreign Wars has raised millions of dollars to support the health and wellbeing of veterans and to continue to honor all who have fallen. The poppies became the symbol of the Veterans of Foreign War and Memorial Day when Colonel John McCrae, a surgeon with Canada's First Brigade Artillery, wrote a poem memorializing the rows and rows of graves that were witnessed at Flanders' Battlefield in western Belgium during World War I. McCrae summarized his feelings in his know well known poem, In Flanders Fields.